The Calvin College Festival of Faith and Music was a tremendously interesting, fun and striking event; my 16-year old Marissa and I enjoyed the 11 hour trip to Grand Rapids, anticipating the lectures (Mako Fujimura, Andy Crouch, Cornel West), workshops, and concerts—from the large and loud Lupe Fiasco hip hop show, the provocative and joyous indi-rockers Hold Steady, to the quiet and acoustic stuff in intimate venues. Over the Rhine was large but not too loud (ahh, what a band they have with them this time out, and what a voice Karin still has!) Nashville singer songwriter Julie Lee blessed us with lyrics from Emily Dickinson and a stellar band (including Stephen Mason from Jars of Clay on a brooding lap steel.) I couldn’t help but think her voice was like one of my favorite Southern singers, Nanci Griffith. The worship musicians were serious, solid, acoustic–the BiFrost Worship Arts Hymns Project, with personal from the Sufjan Stephens’ produced Welcome Wagon album (which I hope to review one of these days), was wonderful to behold. We now have the BiFrost hymns album in stock, which I will review shortly. Somewhat in the spirit of the Indelible Grace albums, BiFrost offers classic old words re-done by edgy alt acoustic artists like Seattle’s Rosie Thomas, David Bazan (Pedro the Lion), Damien Jarado, Denison Witmer, Leigh Nash, and others we really appreciate, done with gusto and hipster earnestness in great low-fi. (Check out their myspace here. Here is an article from the Episcopal Diocese of Washington about them.) We’re told some label may be picking this up for national distribution, but we have ’em now, and the great price of $10.00. As much as I liked the Festival music, and being around performing artists, writers and serious cultural creatives–thanks to the Davids Bazan and Dark for their friendship and stories, and Justin McRoberts for his good mind,heart and talent—the highlight was, for many of us, seeing the tidal wave of astonishing energy from one of America’s most high profile public intellectuals, Princeton University’s Dr. Cornel West. We’ve stocked West’s books since our earliest days; the Presbyterian Publishing House (Westminster/John Knox) did Prophesy Deliverance! in the early 80s, and it is happily back in print ($24.95), and his Prophetic Fragments, has recently been re-issued by Eerdmans; ($29.00.) As a major African-American social critic and philosopher, he has been on NPR and Tavis Smiley and popular papers often these days. There is now great anthology of West’s serious work, The Cornel West Reader (Basic Civitas; $22.00.) To see a young black scholar publicly thank Dr. West for that book—holding a dog-eared copy up of the 600+ page volume for all to see—brought tears to my eyes, reminding me of the power of books, popping up even at a music/arts festival. Searing, it is, and an essential book in our view: Race Matters (Vintage; $12.95.) In person, his powerful and prophetic talk is laden with sweeping gestures and sly wordplays, and good references to Curtis Mayfield and Marvin Gaye and Funkadelic (who else would link Parliament/Funkadelic with Plato’s famous dictum that good education is preparation for dying well, and make the case very well?) Cornel has a long-standing interest in black popular culture, and is known for his work not only citing Shakespeare and Marx, the Bible and postmodern philosphers, but for his enthusiastic engagement with black music (Coltrane, and Mile Davis, of course, the socially-conscious likes of Gil Scott Heron and Stevie Wonder, through contemporary rappers like Kayne West.) This was, legend has it, much of the reason for his removal from his prestigious post at Harvard. That the Calvin College music Festival team conjured up an interview with Lupe Fiasco done by Cornel West was genius; they both esteem each other, even cite each other, but had never met. That it went so well made many say it was worth coming to the event just for that historic moment. Lupe is a smart, influential and spiritually aware African American performing artist, and to see the feisty, energetic elder West probe him, push him, encourage him, even pastor him, was nothing short of glorious. I might have wished for more discussion of Lupe’s urban vocabulary, the role of satire in his street narratives, the apparent project of using rap to deconstruct the stereotypical excesses of hedonistic rap culture. What we got, though, was a helpful and inspiring framing of the heart and mind of this popular artist who may not yet even be at the top of his game. And, that was followed by one of the best lectures/speeches (sermons?) I’ve heard by Dr. West that evening. It was great to hear him affirm Calvin and its Reformed vision as that place where this important stuff was going on. I was so inspired by Dr. West that I wanted to offer our BookNotes readers an incentive to join the conversation. 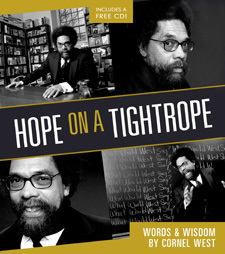 We’ll offer the recently published collection of Cornel West, a recently published handsome hardback (with an exciting CD included) Hope on a Tightrope: The Wit and Wisdom (Hay House; $19.95) for the blog special price of $14.95. $14.99) A major tip o the hat to Z for releasing this very, very cool book, a book that is honest, creative, Biblically-faithful and very inspiring. The author has been steeped in jazz music and although this is not a book for musicians, or even about music, really, it picks up the jazz tradition, uses jazz as a metaphor for the life of faith. It has been said before, but never with such heart-rending passion: jazz themes such as improvisation, collaboration, working the minor keys, balancing freedom within boundaries, the interplay of the individual and the group, and the like, are great ways into a conversation about how to live as faithful followers of Christ. What might a “jazz-shaped faith” look like, this book asks—and how could it help us fulfill the message of the gospel in a way no method, no movement, or structured program or ministry plan could? How might the jazz practices of “casual apprentices” and “jam sessions” and “time in the woodshed” help us find our syncopated groove in Christ? This book is fabulous, fun, and very insightful. Rev. Gelinas is a pastor of Colorado Community Church, a multi-cultural and multi-denominational mission. He dedicates much of the book to a friend of ours, the fascinating, fabulous, solid-as-a-rock brother Dr. Carl Ellis (author of Free at Last? The Gospel in the African-American Experience [IVP; $18.00].) Gelinas, like his mentor Dr. Ellis, is obviously fluent in the jazz idiom, but it never bogs down in historical details; he has the requisite quotes from Louis Armstrong and Wynton Marsalis and Ken Burns, but keeps it moving, always showing how learning this stuff could be helpful for God’s church. Do I hear an A-men? One of the great parts of Finding the Groove is his introductory and delightful overview of several important jazz musicians such as the troubled and seeking John Coltrane, (whose famous liner notes from A Love Supreme are transcribed here) and the seminal Mile Davis. Gelinas situates these artists in their proper setting, a racially charged and complex transitional era in our nation’s history. He grooves on what might be called jazz novelists, especially Ralph Ellison’s Invisible Man, a novel that clearly emerges from the racial themes of the jazz age and the Harlem Renaissance. His riff on the European Renaissance that gave us one Martin Luther and the Harlem one, which gave us another Martin Luther (King), is worth the price of the book! His naming our sins of racism and the complexities of our culture are vital, but not overwhelming. He, like Cornel West at Calvin last week, drops wonderfully playful allusions to important works—-being a “Blues People” (Amiri Baraka) and “Mo Better Blues” (Spike Lee) and the famous question about “why the caged bird sings” (Maya Angelou) making this a culturally-savvy education and a delight to read. He offers great sidebar quotes—did you know Martin King spoke at the famous Berlin Jazz Festival in 1964, talking about God’s gift of creativity? 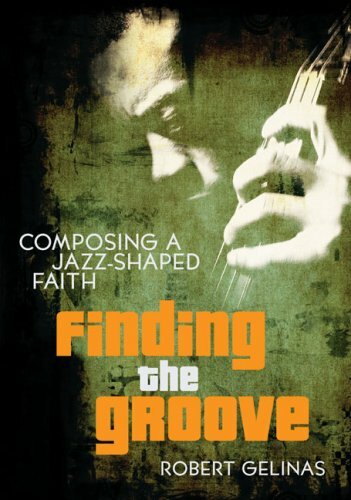 Finding the Groove:Composing a Jazz Shaped Faith is easy to read, brief, a bit unsettling (jazzeneutics is his invitation to improvise with the Scriptures) and a moving reading experience. You can check out some of it at www.jazztheologian.com. Buy the book from us, get your groove on. Yeah. SOOOOO jealous you got to attend that great event. Two people wjo you didnt mention that were there were Charlie Peacock and Steve Nichols. They were great as well, I am sure. The Welcome Wagon CD you mentioned in passing is superb. Everyone who is a Hearts & Minds fan should buy it…. Oh yeah, there were so many good people there…funny, I didn’t even see Charlie or our local boy Stephen. Andy C talked a bit about the blues, so it set up Nichols perfectly; I wanted to go to his workshop but it was the other side of campus and I had other stuff to get to. My regrets. I think CP left early and he wasn’t at any of the speakers afterparties. We’ll have to get him to Central PA soon. I am thrilled to hear you “simply attended” the festival! Without hauling boxes!!! I am crazy about Cornel West– I have a copy of the talk he gave at Gordon College, a treasure. So can we get you to “simply attend” The Glen Workshops? Bi-Frost was wonderful. Really a thrill to see a packed auditorium of college students learning then belting out modern folk-hymns. I’m ordering their cd from you! I am really sure, a lot of people have some information connecting to this good topic in the essay writers . Great overview. Your style of writing is really a joy to read.